If you can remember the name of this model after one glance you're better than us. 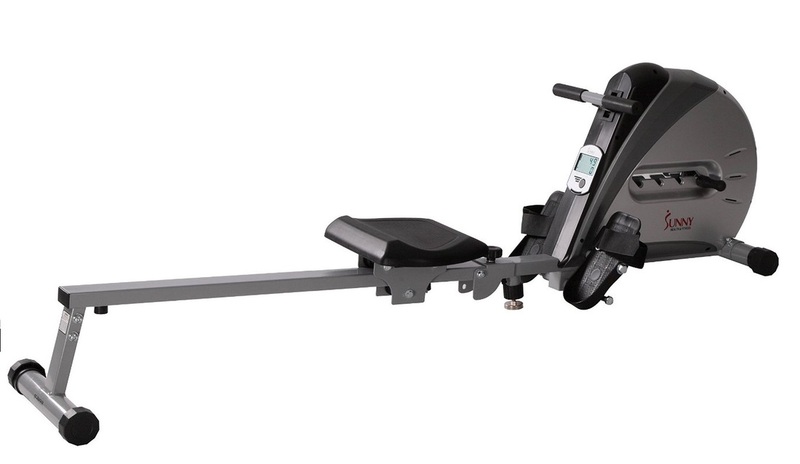 But can a budget rowing machine with an instantly forgettable name leave a lasting impression? Well read our review and we'll let you know. This is the forth Sunny model we've tried and from our experience they're hit and miss. Forget the lowest priced in the range, namely the Full Motion and Sunny, but the magnetic model (and equally complicated name) the SF-RW5515 is well worth a look. But at less than half the price, what does this model have to offer? New for 2016, Sunny have aimed another machine strictly at the low-price market - so please bear this in mind before buying. Budget models cost less because the materials used are lower quality and often that means less sturdy and durable machines - see our article, 'are budget machines false economy' here. For some this makes it a no-go if intending to use it every day for 30-40 minutes at a time. But if you're a beginner or will be a light-user, say around 3 times a week for 15-20 minutes this might (with some reservations) meet your needs. Firstly, this is a quick and easy machine to assemble - however be warned, the instructions are not particularly useful. But if you've got a little DIY know-how you won't need them. The rowing position is okay but if your knees or back are not as great as they used to be, then you might find it difficult to get on and off the low seat. The handle is reasonably well padded to get a good grip that shouldn't lead to hand blisters. 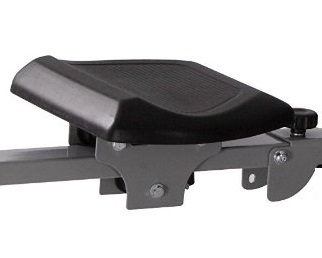 The large, adjustable footrests are good for a budget machine and hold the feet nicely in place when rowing. The seat slides quite smoothly up and down the rail and is quiet enough for home use without upsetting the neighbours. 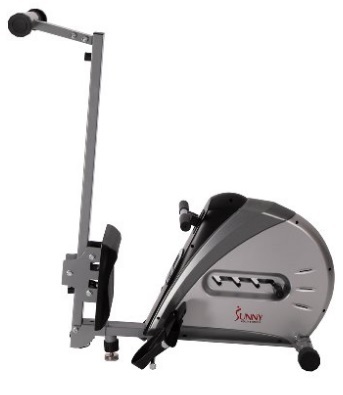 But one of the reasons it's quieter than air resistance machines, is also one of the reasons that let this model down. It's unusual in that it uses an elastic cord to provide the resistance. But while the cord looks quite tough, time will tell how long it can handle regular workouts under strain. It has four levels of resistance that can be selected using a lever - see photo on the right. However, some may find even the highest level does not make for much of a challenge. Once finished, you can fold it up and store it out of the way. This isn't a large machine but when folded (see photo on the right) it still takes up space - and watch out for the back support leg as it sticks out at an awkward angle. 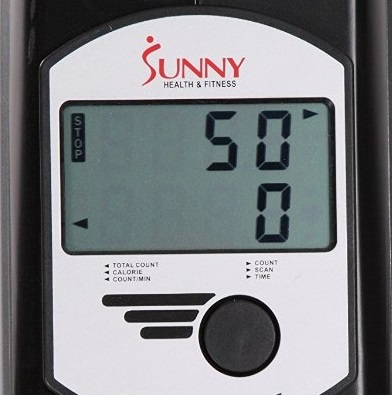 The battery-powered LCD screen is easy to read and displays basic workout data. But... it is very basic and we would question the accuracy of the calorie counter as it can't measure your actual effort using the crude mechanism on this rower. But you could use it purely to make comparisons with previous workouts. 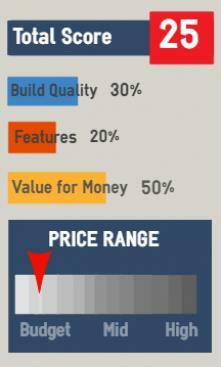 If you want more accurate data from a monitor you'll have to be prepared to spend more. For another $80 you can get a much better machine such as the Proform 440R or the Marcy. 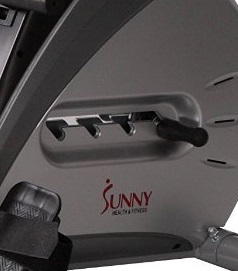 Or a much better machine from Sunny is the SF-RW5623 - an air/magnetic resistance rower.